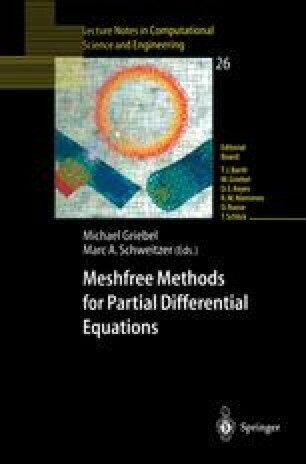 Do Finite Volume Methods Need a Mesh? In this article, finite volume discretizations of hyperbolic conservation laws are considered, where the usual triangulation is replaced by a partition of unity on the computational domain. In some sense, the finite volumes in this approach are not disjoint but are overlapping with their neighbors. This property can be useful in problems with time dependent geometries: while the movement of grid nodes can have unpleasant effects on the grid topology, the meshfree partition of unity approach is more flexible since the finite volumes can arbitrarily move on top of each other. In the presented approach, the algorithms of classical and meshfree finite volume method are identical - only the geometrical coefficients (cell volumes, cell surfaces, cell normal vectors) have to be defined differently. We will discuss two such definitions which satisfy certain stability conditions.